Our Forza Traditional Espresso begins with the finest blend of 100% Arabica beans, our southern Italian roast, creates a dense, caramel-like sweetness and a smooth, satisfying finish. 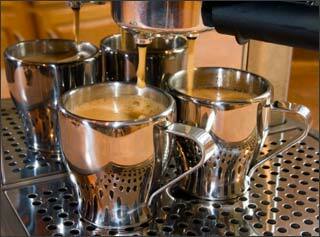 Our Italian roast gives you the aroma and essence of drinking espresso in a fine European coffee bar. Our coffee is lightly roasted and bagged fresh daily. If you are an espresso coffee lover, this is the espresso experience for you. Our line of Dessert Espresso comes in three traditional Italian flavours Chocolate Truffle, Tiramisu and Sambuca. Each unique flavour gives the enticing taste and flavour of its Italian heritage. Our Dessert Espresso can be enjoyed as a great espresso coffee or a great way to end a meal. Please enjoy all three flavours. For great new drink recipes and baking ideas with our new Dessert Espresso, click here to view our recipes.